The issue here is that Java 9 doesn't just deprecate a method, it makes reflection model obsolete and warn you because this will be strictly unsupported in a future release. This has impacts on many popular frameworks : Spring, Hibernate, Guava ... (and Jenkins for sure). This is such a backward incompatible change we will need to live with, as more will come with future versions of Java platform. There's a workaround for such issues, relying on a fresh new API introduced by Java 9 (VarHandles for this specific reflection problem) but does this mean your favourite framework will only support Java 9+ for new releases ? (ab)use of reflection to access Process pid attribute can be replaced in Java 9 with a fresh new API. If we want Jenkins to run on Java 9 we need to replace ProcessUtil legacy implementation with this new code. But on the other side we still want Jenkins to run on Java 8. Here comes JEP 238 "Multi Release Jar". The idea is to bundle in a Jar implementations of the exact same class targeting distinct Java releases. Anything before Java 9 will pick the plain old class file, but Java 9 will also look into META-INF/versions/9, Java 10 to look into META-INF/versions/10, and so on. So web can write the ProcessUtil class twice for Java 8 and Java 9, and get both included in the Jar, and used according to the platform which actually run the code. Looks good, but now comes the funny part : how to write and bundle a class file twice in a Jar ? And here comes a maven chicken-egg issue. The class we want to re-implement with Java 9 APIs do rely on some classes defined by the main library as type references. So core has to be built first by maven, then java9. But we still want to distribute a single Jar, with a single POM deployed to public repositories. 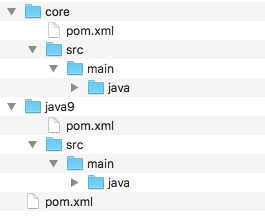 This hack do run java 9 compilation on sibling "java9" source directory from within the core maven module. As a result I can deploy artifacts from this single module without polluting my pom.xml with unnecessary sub-modules dependencies. java9 module is configured as a java 9 jar module so my IDE will detect it accordingly, and depends on core module, so I can access all types to re-implement the class I want to replace.